If your kids are graduating from college wondering what to do with the rest of their lives, and they’re interested in the health field, but avoid it to make more money elsewhere, keep reading. If not, keep reading anyway! Thank you. Today, “kids” are encouraged to be entrepreneurs. Start a company at the age of 3! All before they EVEN know what to do with money (reminds me of a blog Brian Cuban wrote about why sports figures or celebs end up broke). I think the future is going to include founders. How many “founders” are there today and where will they be in 20 years? I understand why it’s happening. You get fired up every time you read about a dumb idea getting millions of dollars in funding. It’s frustrating because you think your ideas are FAR BETTER. Those articles encourage kids to quit their jobs or not attend college at all. The unhealthy message they get is just come up with the next great thing, get funded and you’ll be fine. Let’s peak behind-the-scenes. Some crappy idea getting millions in investments may be one college buddy who is now a VC helping another college buddy. No intention to “save the world” which a lot use as their mission statement. That buddy VC attracts others, who have no idea they are going to lose money because it was just a gift to a friend, and not a real investment in anything real. The Nancy Drew in me can spot scams before they become public. We need a delete/block in life for folks who try to take advantage or exploit others. Lots of snake oil salesmen out there feeding off of hungry entrepreneurs. There’s also other little factors you can’t control. So, your idea being better means nothing. Additionally, even if it’s legitimate, the majority of those companies will fail. Proven fact. Even if you get funding, expect to work your you know what off for one VERY expensive lesson. I digress. Back to HOTTEST HEALTH CAREER of the FUTURE. If you REALLY want to change the world and have an interest in health –take a look at the future and where there will be ACTUAL demand. HERE’S A GLIMPSE through my eyes. 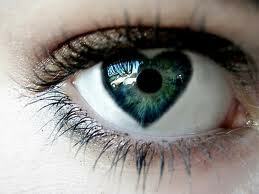 My parents always say, “Maria has a big heart.” So, if eyes are the windows of the soul…my green peeps would be shaped like this. 20% of all U.S. physicians are 55 or older, including more than HALF of the 5,000 active board-certified thoracic surgeons. Approximately 70% are expected to retire in the next 13 years, dramatically shrinking the provider pool leading to a critical work shortage JUST when aging baby boomers are sick and tired of stomping on grapes. By 2025, some experts predict the number will be almost 2,000 short of what’s needed in the U.S. The demand for heart surgeons will explode. They battle both heart disease AND lung cancer –another baby boomer problemo. That’s right. Your kid makes 350K right out of college. CA-CHING! How long do they need to study? Residency required is 5 years followed by 2 fellowship years. You may work 50 hours a week, but you’ll do that if you’re entrepreneur too. Only you’re creating crazy things in the HOPES of creating demand. Even if there IS a demand, you HAVE to convince friends, family or PWM (People. With. Money) you haven’t lost your marbles. Does the product or service create the demand or vice versa? 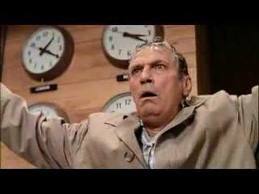 I say when people need something it’s subconscious. When it shows up, they recognize it because the need (demand) was already there. It does NOT exist first. I aced marketing in college with one other person. That tells me 2 out 10 people in a room understand. The other 8 wait to “see” something first. They lack vision. Now, let’s look at a man with all his marbles AND vision in tact. 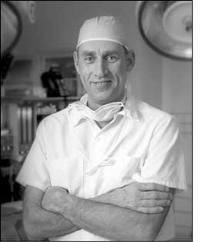 He is one of the best cardiothoracic surgeons in the world. I say THE best. His name is Delos “Toby” M. Cosgrove. I am honored to call Mr. and Mrs. Cosgrove friends. 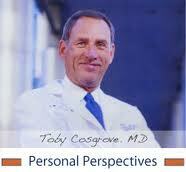 When I first met them in 2001, Toby was Chief Cardiothoracic Surgeon at the Cleveland Clinic. Today, he is Chairman. 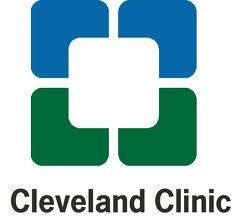 Under his leadership, the Cleveland Clinic’s heart program is consistently ranked NUMERO UNO. 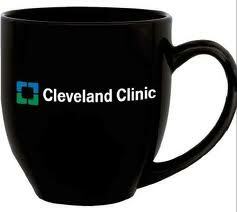 He presides over the $6B healthcare system that is The Cleveland Clinic. Calling him an innovator is also an understatement. He holds 30 patents and is absolutely brilliant. I spoke with Toby about what it takes to be a resident at the #1 heart program and will share that later. I followed him and went behind-the-scenes as he interviewed the best and brightest students to be selected for a residency at The Cleveland Clinic. Since it’s ranked #1, it attracts the smartest students from around the world. Interestingly enough, there was only one woman in the group. In general, 66% of physicians are male. Only 29% are female. Another shortage and demand for the future. Tie this with the current obesity epidemic, a leading cause of heart disease. 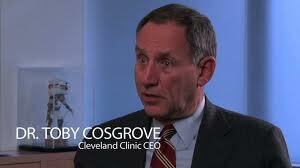 Most recently, Cosgrove warned people about the link between heart disease connected to the foods you eat. You know when a man who would profit from your heart disease issues a warning –it’s time to listen. We’re gorging ourselves into an epidemic of chronic disease, the costs of which will soon overwhelm our ability to pay and continue to be a contributing factor to the ever-increasing national debt. More proof of this has emerged with two studies that have uncovered new links between common foods and heart disease, stroke and death. The culprit is a little-known substance called TMAO, or trimethylamine-N-oxide. It’s created when bacteria in the gut interact with two specific dietary nutrients – carnitine (found in red meat and dairy products) and lecithin (found in egg yolks, liver, beef, pork and wheat germ). We now know that TMAO helps fatty substances in the blood to accumulate in the walls of the coronary arteries. These accumulations, called plaques, are the frequent cause of chest pains and heart attacks. These findings were made in two recent studies by researchers in the Cleveland Clinic Lerner Research Institute and reported in the New England Journal of Medicine and Nature Medicine. It’s interesting to note the usual bad guy in heart disease, dietary fat, is not the person of interest here. Carnitine, the substance that gut bacteria convert into TMAO, is not in the fatty part of the meat. It’s in the red, meaty part. So it doesn’t matter if you cut the fat off your steak, or if you buy lean cuts. So there’s no getting away from it. We have to be more careful about what we put in our mouths. We need to be aware of the foods that contain high amounts of carnitine and lecithin. But the real message of this research is broader – each person’s unique gut flora has a tremendous impact in how our bodies react to these nutrients. Those with TMAO levels among the top 25 percent had 2.5 times the risk of a heart attack or stroke compared to people in the bottom 25 percent. Such a finding could change the way we prevent and treat heart disease, by using TMAO blood levels as a marker of cardiovascular risk and possibly a treatment target. No one is suggesting the complete elimination of red meat and egg yolk from your diet. Like so much in life, moderation is key. You can continue to enjoy a good steak, but you may want to limit it to about 4 to 6 ounces every other week. We’re facing an avalanche of chronic disease in the coming years. Anything we can do to mitigate this avalanche of heart disease — and other chronic conditions like cancer and diabetes — will not only give us longer and happier lives, it will improve the economic outlook for our children and grandchildren who will ultimately have to pay for our poor lifestyle choices. 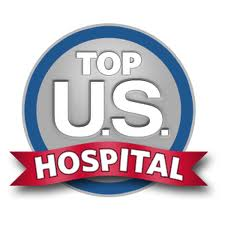 According to the U.S. Census Bureau, as of 2010, there were over 850K licensed physicians in the United States. 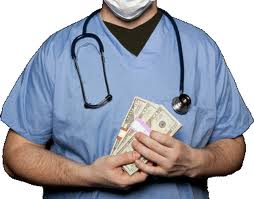 In the United States, there are approximately 24,000 physicians for every 10,000 people. I wanted to find out how many physicians per people there were in the healthiest countries. Turns out, the average is 34.9 physicians for every 10,000 people. 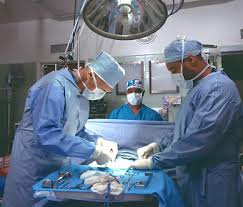 So, the shortage isn’t just in the field of cardiovascular surgery. I am a HUGE fan of preventing disease instead of treating it. Will we no longer need physicians or surgeons if we are able to prevent disease? Too late. Even if you are healthy today, you still exposed an inordinate amount of toxins in the environment AND stress caused by factors you can’t control. Staying healthy involves continually being educated on what toxins to avoid AND learning and relearning healthy strategies and HOW to remain calm in the face of adversity. There is A LOT of adversity in the world. Enough to make you sick. So, any disease that exists now or in the future has already been created and needs to either be REVERSED or TREATED. It will take as long as it did to create this disease to rid it from the existing population in the world. The only people who can completely benefit from PREVENTION are those who are A) already healthy or B) newborns. And these two groups still need to be consistently educated on prevention from people like Delos M. Cosgrove. So, if you’re smart and want to help change the world, it’s a field that will have an opening for you when you graduate with a good starting salary. Of course, I know everyone isn’t “cut” out to be a heart surgeon or can be. All I’m saying is if you CAN, do it. The only question is do you have the academic grades for it? 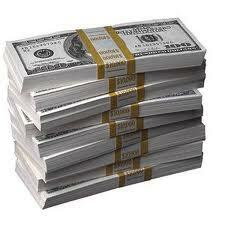 If yes, you can find financial resources. If you don’t have the grades for it or it’s too late to select this field –then encourage a smart kid to explore it as a career. I know recent college grads who make between $7 to $15 an hour or $20K, which was the starting salary THIRTY years ago AND the economy was thriving then. So, if you or your kid is smart –think longterm. You need patience to be an entrepreneur OR a heart surgeon. The latter guarantees success & innovation as dexterity is now a criterion as robotics and computers enter operating rooms. Think of it as fun playing video games while saving lives. More importantly, it’s a career with HEART that won’t have you screaming, “I can’t take it anymore!” at the end. p.s. I was a founder before it was cool or part of a herd mentality. Speaking of leaders, be sure to FOLLOW DELOS M. COSGROVE as a THOUGHT LEADER on Linked In. Click FOLLOW button on upper-right-hand corner of this blog to be alerted by email when there’s a new post, thanks.